Vision: Sell the business in 10 years and retire; finish paying for childrens’ education; have enough money to live a comfortable lifestyle but also have enough to care for their special needs son (their greatest concern). Awareness: We collected all of Paul & Mary’s data and found they were above the confidence zone with a 99% probability of achieving their Vision if they continue their current path. Plan: In a live planning session we made adjustments to optimize their confidence score to 85%. In doing so they were able to reduce investment risk, give to charity, and spend more money each year. Business: Selling a business is a very difficult thing to do. Rarely do we see a business sold on the owners terms or for the right price. It’s very important to plan years in advance. 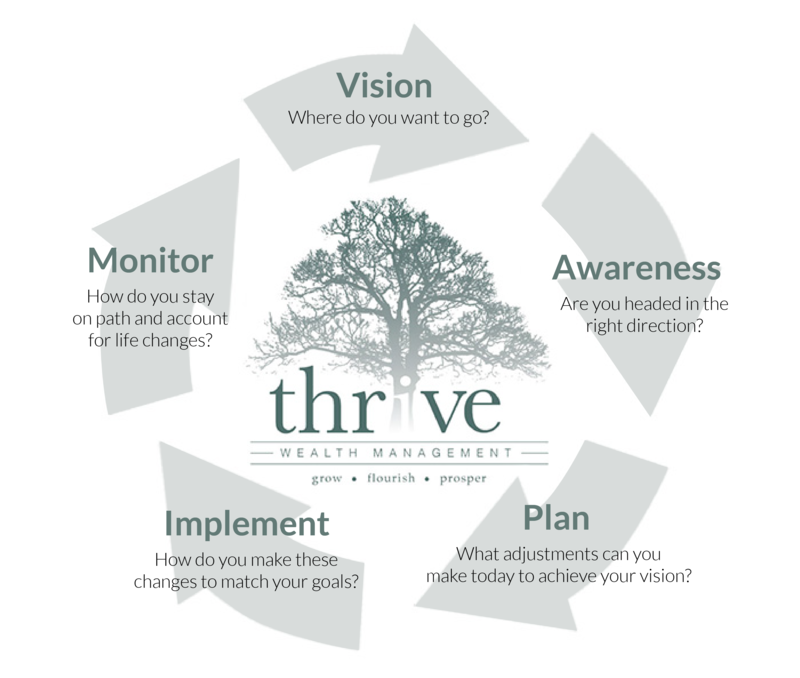 Thrive worked with Paul & Mary to create a team of advisors (accountant, lawyer, and business growth coach) to properly plan for the future sale of their business. This process created efficiencies that increased annual revenue by 40%, rejuvenated their drive for the business, and their personal income jumped over $1M/year. Investments: Paul had a difficult time resisting the urge to continue pumping money into the business. Mary on the other hand was uncomfortable with the risk and welcomed the idea of diversification. Paul and Mary now have a Joint Account worth $2.7 M (both from focusing on building up their investment account and creating a diversified growth oriented investment portfolio). Thrive also took over management of Paul’s company 401(k) plan and increased his contributions to $95k/year by adding a profit sharing feature and including Mary as an employee for the clerical work she performs. Insurance: Modified their entire portfolio to properly fund a succession plan and care for their special needs child (which involved establishing a realistic price for their desired standard of care). Estate Planning: Introduced an attorney that specializes in estate planning for families with special needs children. Created an Irrevocable Trust to care for Paul and Mary’s special needs child. Paul and Mary had a taxable estate. We valued their company and shifted non-voting stock to a trust for the benefit of Mary and their children. In doing so they no longer have a federal estate tax issue. An ideal succession plan for the business was also implemented. Taxes: Saved $1.5M in potential estate taxes and $67k/year in income taxes by increasing their 401(k) contributions and actively managing taxes in their investment portfolio. The results achieved in our simulations do not guarantee future investment results. It is possible that the markets will perform better or worse than shown in the case study; that the actual results of an investor who invests in the manner these case studies suggest will be better or worse than the projections; and that an investor may lose money by investing in the manner the case studies suggest. The case studies assume the reinvestment of dividends and do not include transaction costs for purchases and sales of equities and bonds or mutual funds and ETFs. We assume no deduction for advisory fees, and that assets are allocated in the manner the projections suggest until the hypothetical client reaches age 95. The final results also address such factors such as annual spending, annual savings, timing and cost of goals. Although the information contained herein has been obtained from sources believed to be reliable, its accuracy and completeness cannot be guaranteed. While the case study results reflect rigorous application of the investment strategy selected, hypothetical results have certain limitations and should not be considered indicative of future results or results for any individual investor. In particular, they do not reflect actual trading in an account, so there is no guarantee that an actual account would have achieved these results shown. The 99% (before) and 85% (after) illustrated probabilities of success were derived from licensed forecasting software. The forecasting results are based on a Monte Carlo simulation. In addition to the facts listed in the case study: Investment assumptions in the before scenario include a 10.11% hypothetical average rate of return with a 16.80% standard deviation, while the investment assumptions in the after scenario include a 7.54% hypothetical average rate of return with a 5.86% standard deviation. Annual goal inflation assumptions include 3.0% for Retirement-Basic Living, and 6% for college funding. Marginal tax rate assumptions include 35% for federal and 3.07% for state. Long-term capital gains are taxed at 20%. A federal standard deduction of $24,000 was assumed. 85% of Social Security income was included as taxable income. Social Security income was estimated to be applied for at 70 years of age for both hypothetical clients. $44,320/year of social security income was assumed for Paul, while $17,871/year of social security income was assumed for Mary. Social Security income assumed inflation rate was 1.5% per year. The optimized plan including retirement spending of $400,000 in today's dollars in addition to $100,000 per year from retirement until Paul turned 95. Both retirement spending and charitable goals where inflated by 3.0% per year.